After a close encounter with a missile forces the Doctor to land the TARDIS on a planet at the very edge of the universe that experiences light only one day every thousand years as that rare day approaches, Leela and the Doctor find themselves entwined with Senior Tutor Bengel’s geographical study, soon discovering that the shroud of darkness is far safer than the brightness of day. ‘The King of Sontar’ ended with an emotional bang as the Doctor and Leela had a tremendous disagreement regarding Leela’s choice of action, a fascinating thread of development for a well-explored duo. Although ‘White Ghosts’ unfortuanately does not necessarily deal with the ramifications of that falling out directly, opening with the Doctor apparently ready to forgive Leela after spending several days in between adventures secluded in his TARDIS, it does at least manage to highlight how much the Doctor’s presence has changed Leela as she worries about the Doctor’s well-being, researches her potential foes, and stands up for herself while looking to the less savage parts of her Sevateem heritage to provide an unexpected but immense source of help. Clearly the setting is a vital part of ‘White Ghosts,’ and the perpetually dark planet as well as the more overtly horror-driven tone certainly evoke sentiments stemming from the Philip Hinchcliffe era quite well. Intriguingly, though, the missile that just missed the TARDIS heading for the seemingly dead world also adds an element of a race against time as the underlying mystery of the world beneath it begins to unfold with the memory that the last survey team to explore the world in the light never returned. Yet with the missile’s intent of exploding above the planet to release radiation to which the plants on the planet strongly react, ‘White Ghosts’ quickly becomes very layered and much more complex than initially presented. Indeed, with the hidden agenda unknown to even some of the current survey team’s members to study the long-term effects of bat gene manipulation within human DNA and resultant survivability in hostile conditions, the danger becomes even further amplified from that that the prospect of one seed of this world being able to destroy all life should it reach a civilized world presents. ‘White Ghosts’ also does quite well with supporting character development as the plot and assumptions begin to twist in upon themselves. Virginia Hey as Bengel and Bethan Walker as Aranda are exceedingly strong and perform spectacularly both initially as well as when the vampiric tendencies become known. Of course, this nicely ties in with the Time Lords given their eternal battle with vampires, and it’s perhaps unsurprising that the Time Lords have once more manoeuvred the Doctor into a position to do their work for them once they predict the emergence of another vampiric race. Still, it’s incredibly rewarding to see the situation from ‘The King of Sontar’ flipped as the Doctor must take rather harrowing action to save the universe so soon after admonishing Leela and proclaiming that he is not simply a gun for hire. 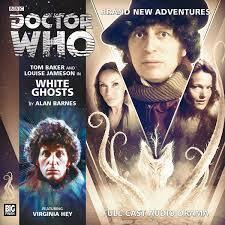 At the end of it all, ‘White Ghosts’ is another very strong story for The Fourth Doctor Adventures. It takes full advantage of its setting and twisting plot as well as the Doctor not knowing everything that’s going on from the start, also giving Leela plenty of action while seeing her approach the verge of hysteria. Although it’s a shame that the direct fallout from the row that ended the preceding serial goes largely untold, ‘White Ghosts’ as a story itself will unquestionably grip attention from beginning to end.